Please refer to our stock # 5218-24 when inquiring. 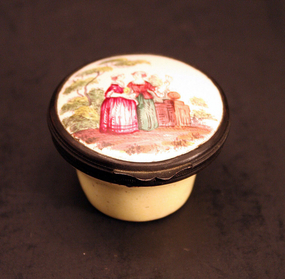 Most likely French, 19th century, snuff/pill box, However, it clearly dates to the late nineteenth century. The lug and ribbed banding on the metal hinge, as well as the loose hand-painted nature of the lid identify this box as a nineteenth century creation. Very good condition. Some loss to interior enamel and on the underside. 19th-century French Imitation of English Enamel Box French 19th-century Enamel Box 19th-century French Enamel Box, "Memoire d'un Ami"